• Repeal the Student Success Funding program, transferring $23.9 million to create a new Access Our Best Public Schools Fund. • Access Our Best Public Schools Fund would be available to high-performing district and charter schools accepted into the proposed Arizona Public School Achievement District. • High-performing charter schools would be able to use the funds to expand existing locations or build new locations. • The main purpose of funds would be to guarantee debt financing. 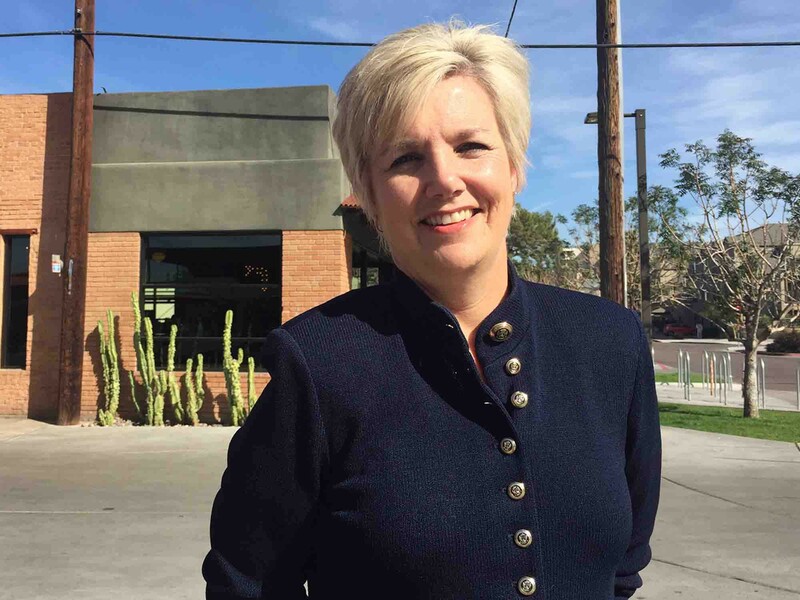 PHOENIX – During the showdown over her firing of two State Board of Education staff members, Superintendent of Public Instruction Diane Douglas accused Gov. Doug Ducey of establishing a “shadow faction” including charter school operators and moving funds from traditional public schools to charter schools. She also claimed that Ducey supports the new AzMERIT test, which Douglas opposes, “to lower school scores so that more students can be removed to charter schools,” as well as backing the board’s new president, who is a charter school CEO. In response to Douglas’ allegations, Ducey spokesman Daniel Scarpinato said the governor doesn’t make a distinction between charter schools and other public schools. “He views all public schools as that: as public schools,” Scarpinato said. In touting his community involvement and service, Ducey’s campaign website lists the Arizona State Board for Charter Schools without detailing his role. According to meeting minutes and audio from the organization’s website, Ducey served as a board member from 2009 to 2012. His campaign transition team included Lisa Graham Keegan, a former state superintendent of public instruction who as a state lawmaker championed the state’s 1994 charter school law. When Ducey held a tele-town hall on education in early February, Keegan joined him while Douglas wasn’t on the program. In his State of the State Address, Ducey called for creating an Arizona Public School Achievement District that would turn over space that isn’t being used by traditional schools to charter schools and other qualifying schools. The district would be funded by $23.9 million shifted from the Student Success Fund, an achievement-based program created during Gov. Jan Brewer’s administration to reward public school districts and charter schools for academic success, to a new Access Our Best Public Schools Fund. Ducey’s executive budget summary says that high-performing charter schools could use the funding to expand existing facilities or build new ones, and it stipulates that half of the projects covered by the fund be in low-income areas. But it would apply to more than charter schools. “The Arizona Public School Achievement District puts a real emphasis on ensuring that projects are done in low-income areas so that every Arizona child, no matter what ZIP code their parents can afford to live in, can have access to a world-class education,” Scarpinato said. House Minority Leader Eric Meyer, D-Paradise Valley, said that while he doesn’t agree with Douglas’ firing the State Board of Education staffers he agrees with some of the points Douglas raised in her response to Ducey. “Seems like he has appointed some people that may favor one type of education over another and maybe favor vouchers over just funding our schools so that everybody can be successful. So in that camp I’m with her,” he said. “So she’s asking, ‘How can I do my job,’ and I agree,” he said. Andrew Morrill, president of the Arizona Education Association, the state’s largest teachers union, said it’s clear from Ducey’s budget that the governor favors charter schools. “I don’t think Governor Ducey has hidden the fact at all,” Morrill said. Debra Duvall, executive director for Arizona School Administrators, said that while she is currently more concerned about Ducey’s proposed budget than his allegiance, there are differences between charter and district schools in the proposal. “It appears that there is an effort to insulate some of the charter funding more so than funding to district public schools,” she said, noting the overall reduction differences between charters and district public schools. The overall reduction to district public schools is 5 percent compared to the 3 percent overall reduction to charter schools, she said. Heidi Vega, the Arizona School Boards Association’s director of communications, said that when comparing district and charter school funding it isn’t exactly the same. District and charter schools receive different types of funding and have different costs, she said. “It’s not apples to apples, it’s apples to oranges when you think about it,” she said. Vega said the association understands and supports parent choice but questions why there isn’t more focus and funding on public schools when the majority of parents choose local neighborhood schools for their children. “When you take the majority of parents, why are we not funding and trying to focus on our local public schools as well and provide them with the same opportunities, when the majority of parents are choosing to pick the local public school to send their child to?”she said. But Eileen B. Sigmund, president and CEO of the Arizona Charter Schools Association, said that by proposing the Access Our Best Public Schools Fund the governor is saying that he isn’t going to divide school districts and charter schools. “This fund is available to all public schools that are doing great for our students,” she said. Keegan, the former school superintendent and Ducey adviser, said the governor’s policies don’t favor one kind of school over the other. “I’ve seen the detail of what it is he’s trying to propose, and it all revolves around exceptional, high-quality schools,” she said. “They’re all public, and that’s the way he addresses it,” she added. Keegan said the conversation shouldn’t be about district schools versus charter schools. EDITOR’S NOTE: Cronkite News reporter Thuy Lan Nguyen contributed to this report. Gov. Doug Ducey's proposed education budget would change the way public schools and charter schools earn their funding. Cronkite News brings you the latest on the state's education debate. Lisa Graham Keegan, former state schools superintendent and adviser to Gov. Doug Ducey, said the governor’s budget isn’t intended to pit public schools and charter schools against each other.